A screenshot of the petition as it appears on the site change.org. A Fairfield, Conn., resident started the petition on Thursday, April 4, 2019. FAIRFIELD — As of Saturday, 48 people have signed an online petition to have the off-leash policy for dogs at Lake Mohegan be changed. The petition, which was started by a town resident on Thursday, has garnered 48 signatures in two days. 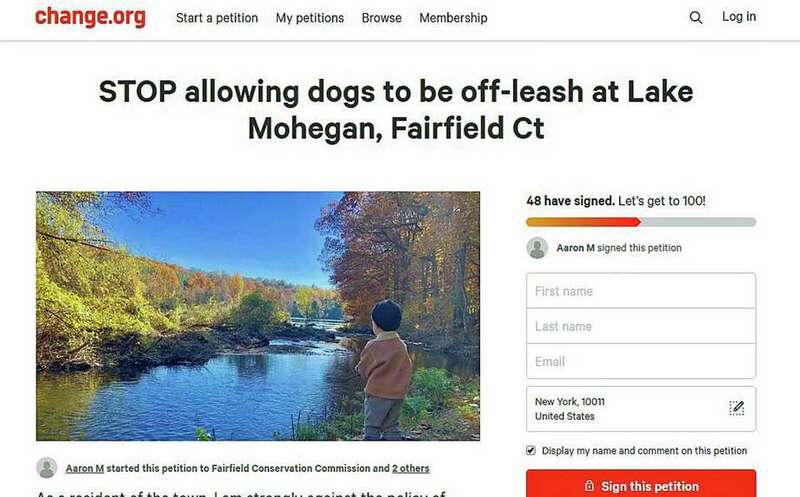 The town resident is only identified on the page as Aaron M. In his description of the petition, he voiced his strong disapproval of the policy at Lake Mohegan — a public area — for dogs to be off-leash. “The off leash dogs are not only an issue for non-dog owning residents trying to enjoy the area but also to the quality of the open space itself,” the resident said in the description. The petition creator said dog owners don’t follow park rules and that there is no one at the park to truly enforce the rules. “When hiking with my children I cannot let them walk more than 10 feet from my side as I need to be close to ward off dogs whose owners are nowhere to be seen,” the description said. Then, the description turns to environmental impacts, talking about dogs wandering off trail and damaging or killing vegetation and causing possible soil erosion. Those who signed the petition expressed similar concerns about the area. John Pinto, who signed the petition on Thursday, said he supported it as a avid outdoorsman and dog owner. “Some dog owners walk the lake as if they own it,” he wrote when he signed the petition. “They don’t pick up after their dog and/or they bag it and throw it off the trail. I have had several encounters, while fishing, that a dog would jump in the water in front of me.